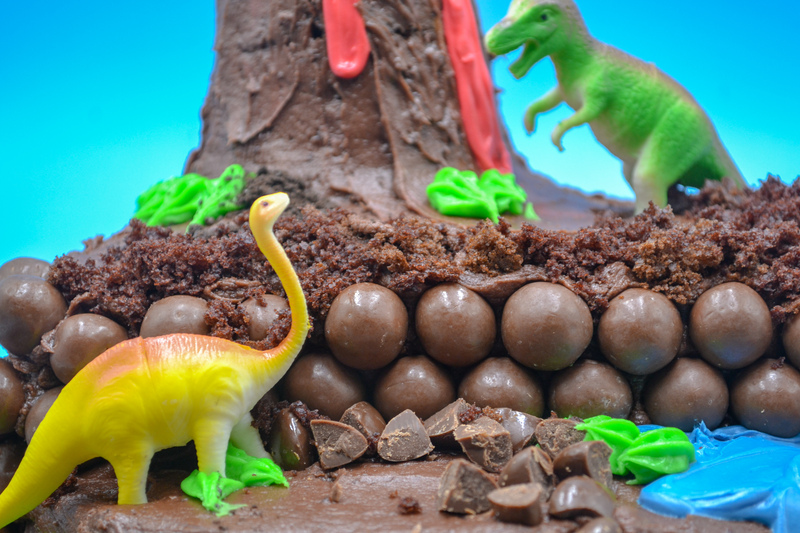 Any Jurassic Park fan will adore this homemade dinosaur birthday cake. Simply made with just a few tools and ingredients, it will be a hit at your next party. 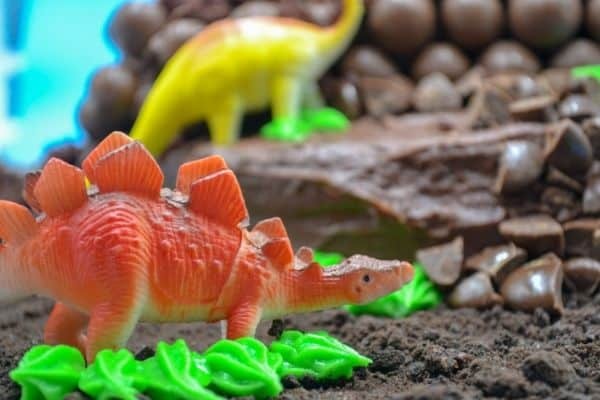 This dinosaur cake for kids is perfect for any birthday boy or girl who loves prehistoric creatures. 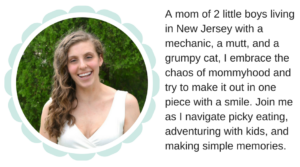 They will get a kick out of the toys as well as the easy to make volcano and you’ll look like super mom. I promise we can keep it between us just how easy this DIY cake is! 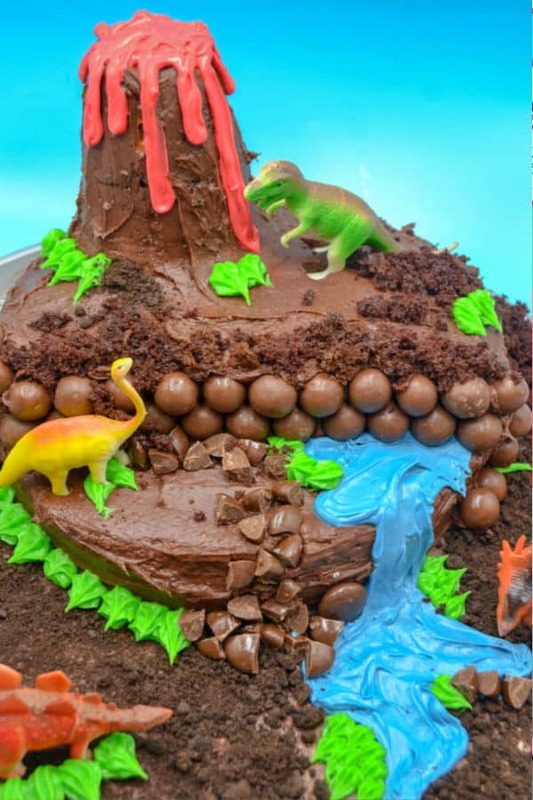 This crowd pleaser of a dinosaur cake took only about 30 minutes and uses toys to create a fun landscape. If you remember, last year I went all out and made Ryan the cake of his dreams – a monster truck cake. To this day, he still talks about it. In fact, with his birthday on the horizon, he’s already telling me he wants another. A few weeks ago, I made Owen his first “real” birthday cake. We made a smash cake for his first birthday, but this year I decided he deserved a unique, themed one. So I headed to Google and went searching to find some inspiration for the dessert of his dreams. In my search, I found a few things I liked, but nothing screamed, “Owen would LOVE this!” to me. It also needed to scream, “this is totally doable!” Since I love to make life difficult, I wung it and out came the easiest dinosaur birthday cake a 2 year old could ever ask for. and doubled it. If you use store bought frosting make sure it’s room temperature. If it seems really thick, whip it up with a hand mixer or whisk before using. You can very easily make this a 4 layer cake if serving a larger crowd - just bake an extra layer or 2 and double up the top and bottom layers. You’ll obviously need extra frosting. This works with both homemade and storebought frosting. Just make sure you whip it up to soften and make it easy to spread. Save your cake scraps to use as crumble as "dirt". I used new, clean dinosaur toys, but you could easily use what oyu have already. Just make sure you clean them up before using. Make sure your frosting is room temperature. If it’s cold, it won’t spread well and will tear your cake. 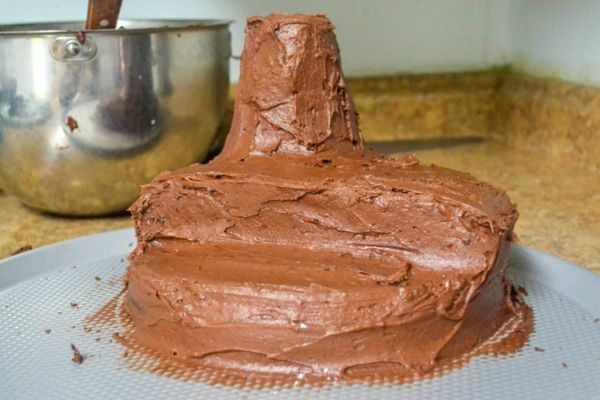 Your cake MUST be cooled completely. I like to bake mine the night before or morning of. Sometimes I’ll brush it with simple syrup and wrap in plastic wrap to keep it moist until I’m ready to use. Put a ton of frosting right on top and spread to the edges. 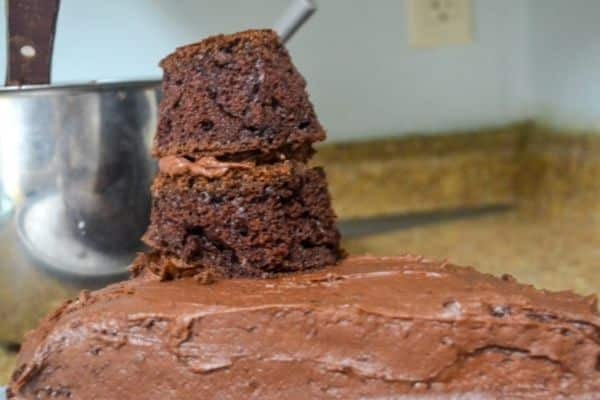 Slowly work from the top center of your cake to the edges. Be generous with the frosting. You can take some off, but it will go on so much easier if you add more than needed. If needed, do a crumb coat. Add a thin layer of frosting all over, then put in the fridge to ‘harden’. This will help you get a super pretty cake. (This is more important for traditional cakes where you’re not covering mistakes with ‘dirt’ and ‘rocks’. Need more dino themed food? These Dinosaur Homemade Pizza Pockets are the perfect pre-cake food! When making these DIY birthday delights, I try to keep it as simple as possible. I don't use anything super fancy because I don't do this often and don't want to store them. Here's what I use! Bake at least 3 round cakes. I baked mine in 9 inch pans, using 2 boxes of boxed mix as per the directions. Use homemade or boxed, just make sure you have 3-4 round cakes. 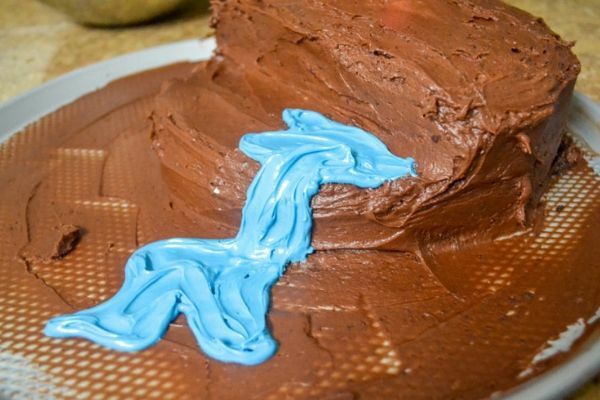 Put a dab of frosting on the base where you want the cake and place your first layer down. I used a round pizza pan, but a cookie sheet or cutting board would work fine. Make sure you have room to make your dino-scape. Frost your bottom layer of cake with chocolate frosting. Cut about ⅓ of the second cake round off. This is going to create dimension for your cake. Place on top, making the rounded edges flush in the back. Take a circle cutter (3-4 inch diameter) and cut 2 circles from the leftover cake. Stack with a layer of frosting in between, place on your cake in the back corner of the top layer. Secure with a wooden kabob or long toothpick. 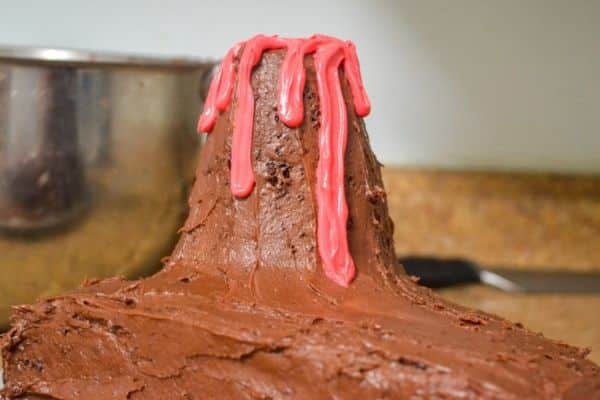 Stick it through the top of the volcano and into the top layer of the cake. Trim the stack to create a cone shape for your ‘volcano’ and frost. Add red food coloring to a small amount of white frosting (I used canned). Put the colored frosting into a small sandwich baggie. Snip the very end of the baggie and pipe “lava” coming from your volcano. Frost the entire cake, not worrying about making it perfect. The best part about a cake like this is that imperfections are totally fine. Now that we know more or less how much extra chocolate frosting we have, spread a thin layer of frosting to your base and top with crumbled cookies and/or cake as dirt. Add blue food dye to more white frosting and repeat the process with creating a piping bag from a sandwich baggie. Create a “lake” on one level by outlining your shape and then filling in and smoothing with a butter knife or offset spatula. Create a “waterfall” from one level to the next the same way, creating a pool on the base for your waterfall to land. Using a store-bought squeeze bag of green decorating icing, create tufts of grass throughout the scene and along the banks of your lake. If you want to use your own, you'll need a star or grass tip for piping. Using the leftover crumbled cake, cookies, and candies, add rocks and dirt to your cake. Finally, add your toy dinosaurs, and then you're done! It might look like a lot of steps, but I promise a lot of it is simple, objective things to make it look cool and nothing is pastry school level. I finished mine in about 30 minutes, but I also was doing to really cool kitchen dance party moves in between.o really cool kitchen dance party moves in between. Okay, so tell me - do you have someone in your life who would love this cake? Do you make or buy your kids cakes? Let me know in the comments! 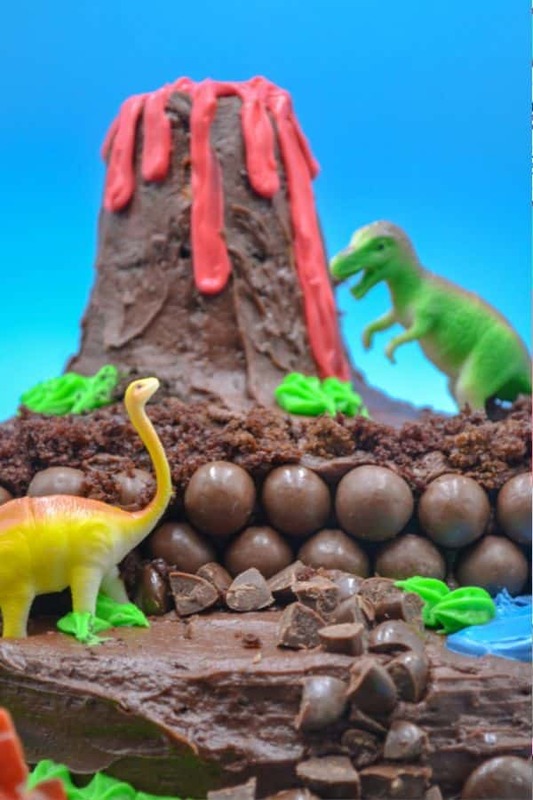 If you enjoyed this dinosaur birthday cake post, you may also enjoy these!